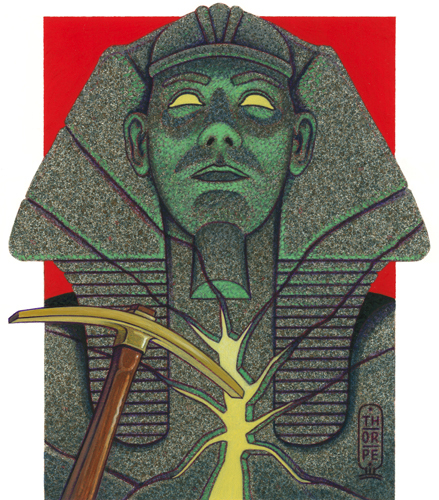 Cover art for the 1988 Mysterious Press paperback edition of The Curse of the Pharaohs by Elizabeth Peters. Illustration by Peter Thorpe. Cover proof of the 1988 Mysterious Press paperback edition of The Curse of the Pharaohs by Elizabeth Peters. Illustration by Peter Thorpe. 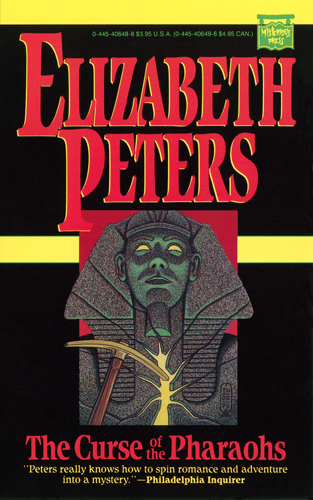 The paperback edition of The Curse of the Pharaohs by Elizabeth Peters was released by Mysterious Press in 1988. Design Director: Jackie Meyer. Design: Barbara Buck. Illustration: Peter Thorpe.